Before the wefie held, do not forget to take some time to look at the compact powder's mirror that we bring in our bag. If the nose and surrounding area looks oily, apply powder to covering that oily area. Use an eyelash curler and mascara appropriately, do not be too frugal. Rather if we put more, it was still acceptable. Mascara is required to make eyes' look 'open' when being photographed. This is certainly affect the result of photos. For acne scars or blemishes on our face that exposure to sunlight, cover it with concealer. For the serious panda eyes, we can cover it with orange-colored concealer to make it equal to our skin color. Photos are about the right taken angle, make sure to obtain a position in the midst when there are friends who are willing to volunteer took our picture together with other friends. For wefie, make sure that the camera holder is our friend who has the longest hand. 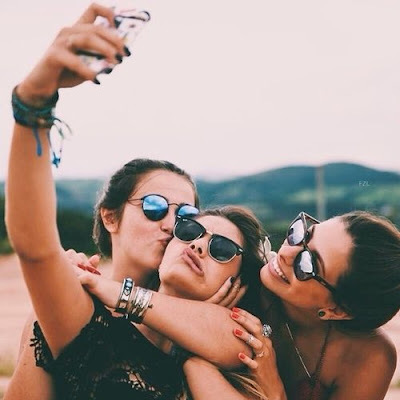 Avoid a position close to the camera when doing wefie, because that anglemade us many times larger in photos. Please know that foundie with SPF will make the reflection of light in our face in the photo taken. The photo taken will not showing our glowing face, but it seem oily. Therefore, in the evening event that we will be attend, better use foundie without SPF. Especially if we already know in advance that there will be an event photographs. For any events that involve eating and drinking, it is definitely will made our waterproof lipstick fades. For make sure our lipstick color still looks good, make sure to put a good base before, do not forget to wear a lip pencil before applying lipstick.